This album is a synchrony of Funk Fusion, World Music, and Jazz featuring award-winning artists Jose Valentino Ruiz (Flute, Sax, Bass, Piano, Keyboards, Percussion, Composer) and Jesse Pitts (Drum Set). Guest appearance by Johnathan Hulett (Drum set). 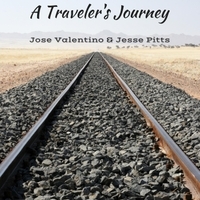 "A Traveler's Journey" is a musical diary of Jose Valentino's experience as a missionary in various countries around the world. These experiences have refined Jose as a human being and as an artist. The album is designed to take the listener to a sonic journey through different parts of the world and different time periods. All of the compositions are original. Musical styles mesh together with decorated lavish improvisations and interactive play between Jose and Jesse Pitts (Drums). The entire album was produced by three individuals - Jose Valentino Ruiz, Tito Ruiz (Father and Mentor), and Jesse Pitts. Every song portrays a unique moment in Jose's life whether it be joy, reverence, nostalgia, confidence, love, and so forth. As a multi-instrumentalist, Jose used his gifts on flute, saxophone, bass, piano, keyboards, marimba, percussion, and vocals to create the compositions. Jesse Pitts's drumming was the perfect ingredient that took the compositions to another level of intentionality and human expression. Johnathan Hulett's beautiful drumming is featured on two songs ("A Deeper Kind Of Love" and "XXIII Century"). Overall, the impetus for the album is to have a representative work of art that honors the innovation of the past and present while creating a new standard for the future. Being a lover of many types of music from various eras and parts of the world, the compositions are a synchrony of World musics, Funk-Fusion, Straight-Ahead Jazz, and Odd Meter Grooves. Jose and Jesse are honored to present this album to the world and hope they are blessed, inspired, and impacted at seen and unseen levels.